The three points approach is used as framework in the toolbox. It provides a holistic approach for organizing integrated stormwater management. 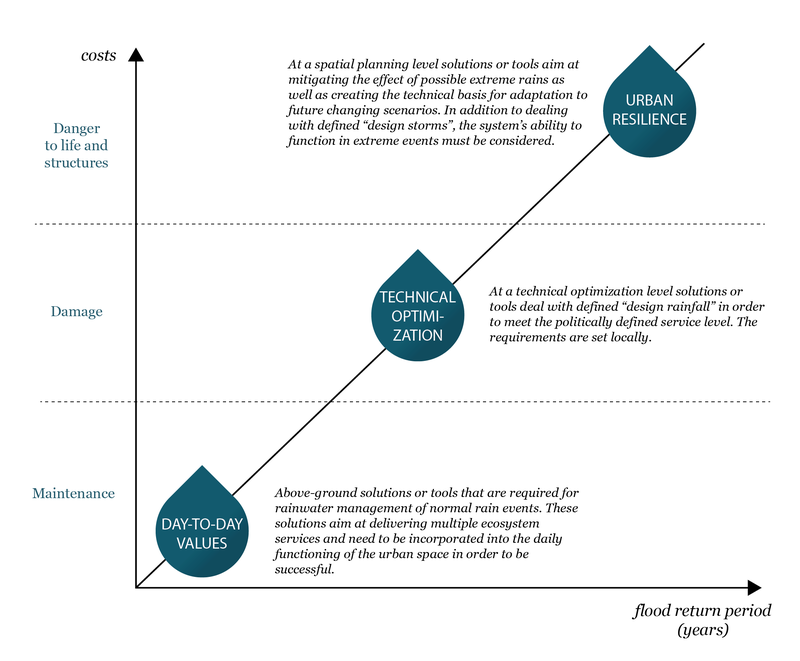 The three domains cover all the actions needed in different planning levels to create a multifunctional and resilient water system. The existing, relevant stormwater management approaches and tools have been classified in three groups, which represent different domains of planning and designing integrated stormwater solutions. The three categories are based on the so called Three Points Approach, which have been initially developed to provide a structure to facilitate the decision making processes dealing with urban flood risk management (Fratini et al 2014). The initial demand for identifying the different domains of actions raises from the increasing complexity of the urban context, and therefore a demand for helping to focus on the right things and finding the right information. The definitions of the three points have been slightly modified to be used for practical classification of tools.